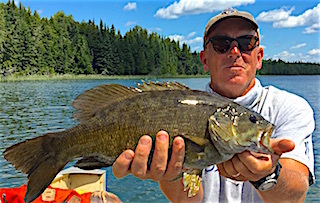 This week started out on the cool side but by mid week heated up, one day reaching over 90 F. Even though the temperatures varied the fishing stayed consistently good. Father & son Bob & Ron Ramsey from Leavenworth, KS & Asheville, NC returned for their 12th consecutive year. 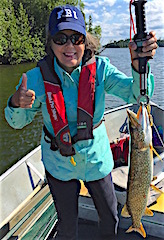 Discovery is great & rewarding as when investigating some new rock structure location they caught some quality Northern Pike in the 33-34 inch range. 2nd day they did the same fishing new open water structures catching fish on just about every structure all being 30-inch plus fish. After talking about more of these rock structure locations they again did well following this pattern catching a lot of good size Pike. 3rd day was a portage lake for Muskie getting more follows than they ever saw, but got rained out after a half day by T-Storms. 4th & 5th days they stuck with their established pattern & caught a lot of bigger Northern Pike & went home with the biggest catch of all, another set of memories between father & son. at Fireside Lodge. The final 2 days they did well catching a lot of Northern Pike most between 27 to 32-inches. Both enjoyed their stay making memories between brothers. 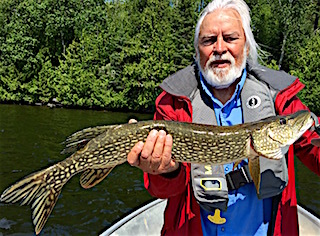 Tom Miller with Son-In-Law George Carney returned for the 10th year wasting no time catching Northern Pike with George setting the bar landing a 34” thick fish. 1st day they caught a lot of Northern Pike with Tom having the hot hand. 2nd day was amazing catching 60-70 Northern Pike before suppertime. 3rd day was another great day catching about 50+ Pike, but the fish bigger & heavier. 4th day was very warm, 88F & humid so their day was cut very short. 5th & 6th days they did well catching some larger Northern Pike and some Smallmouth. Both had another great visit making father & son-in-law memories. Kurt Haines from Avon, IN returned very happy to be back with Kim Wade for her first time. 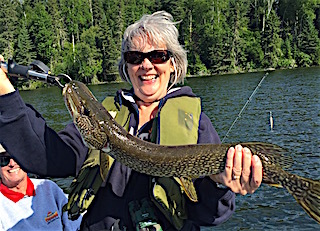 1st day Kim caught her 1st ever Pike & they caught 20+ fish. 2nd day was a fun day catching as many pike as the 1st. 3rd day was a portage lake day having some big follows from Muskie & Kurt landed 1 Muskie. 4th day they did well catching 20 Northern Pike & their 5th & final day they caught well over 40 Northern Pike. Both had a great time and hope to return in future years. a fabulous shore lunch by Twin Falls & Mary Beth finally out fished Larry. 5th day they caught plenty of fish but the windy conditions did play a factor. In fact Larry was quoted as saying that he was tired of catching so many Northern Pike. All left having a wonderful stay and plan on returning one day soon. Returning for their 5th consecutive year were Jerry & Susie Florea from Martinsville, OH. 1st day they got right to Muskie fishing with great success having plenty of follows & landing two Muskie. 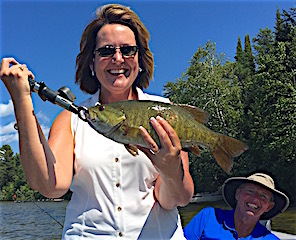 Jerry caught a 27” & Susie caught a BIG 39” Muskie which was her 1st. That same evening Jerry went out by himself & hooked a MONSTER Muskie on 8lb test line fishing a Jitter Bug for bass. After a 30-minute fight Jerry was able to manage landing this fish that fully filled our 48-inch cradle. After some care the fish released fine awaiting another angler encounter. 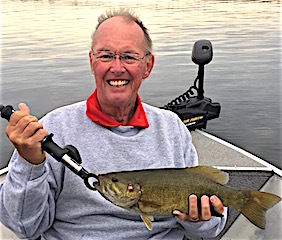 During their other 4 days they caught fish, mostly northern Pike, one day catching close to 40 and Jerry caught a HUGE Master Angles Trophy Smallmouth Bass measuring at 19-inches. They left having a great time and already reserved their dates for 2017. Back for his 3rd visit was Jerald Lester with his wife DJ and friends Lee & Mary Webster, from Waconia & Maple Grove, MN, for their 1st Fireside Lodge experience. 1st day they had some nice Northern Pike action for several hours. 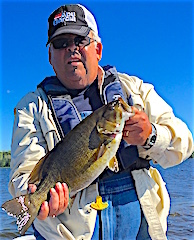 2nd day all had fun catching 0ver 20 Northern Pike and both Jerry & Lee caught Master Anglers Award Smallmouth Bass. 3rd and final day was loads of fun catching a mix of Northern Pike of a variety of sizes and from the looks on their pictures they were having a blast fishing together. All left having a great time saying the will return. Mike & LeAnn Sebade from Wyoming were visiting us for the first time. Mike is a Fly Fisher and he or LeAnn have never fished in Canada before. 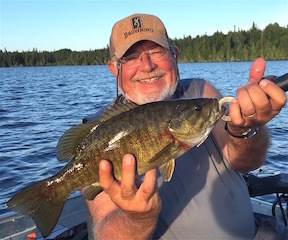 DOA they found fish quickly having follows and Mike switching to poppers caught a few big Smallmouth Bass plus missed several others. 1st day they did great with Lee Ann catching her 1st ever Muskie, & Mike doing very well catching Northern Pike & Smallmouth Bass fly-fishing. 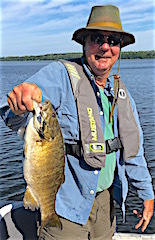 3rd day was excellent catching many Pike & Smallmouth & Mike said they caught many Big Smallmouth Bass. 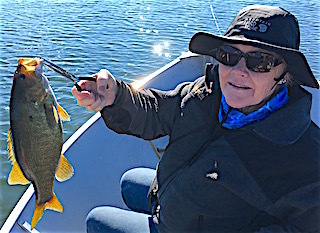 4th day was FABULOUS catching over 40 Smallmouth Bass 16-18” LeAnn catching 19” & Mike a 20.5” Master Anglers Trophy Smallmouth Bass. Both left saying they had a terrific visit and would love to return in the near future. Father & son Paul & Tony Capecchi from Inver Grove Hgts & Woodbury, MN were back for their 2nd time this year making their 16th trip bringing for the 1st time Tony’s wife Jody & there 2-year old son Joseph. 1st day was wonderful with Paul & Tony fishing in the morning & then all went to Twin Falls & had a great shore lunch. This was a fun event with Jody & Joe discovering Twin Falls for their first time on a picture perfect day. 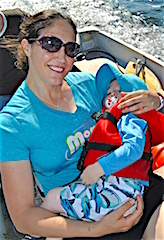 Also, Joe took his first boat ride and experienced the catching of a Northern Pike. Their 2nd day was focused on Muskie fishing in the morning having follows with Paul catching 1 & on the 3rd & final morning they caught a lot of Northern Pike. Both days as a family they enjoyed our Fireside Lodge surroundings and each day had a swim. All had a wonderful family experience making memories for years to come. Father & sons Dan, Mike, Patrick, & Don Cahalan from Rockwell, Urbandale, Adel, & West Des Moines, IA were visiting us for their 1st time. This was a special trip as Dan had made a trip to Canada many years ago and had always wanted to come back. 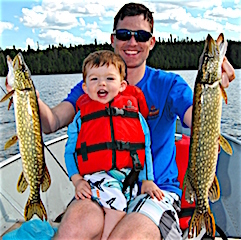 His sons decided to make it happen so they could share the experience of fishing in the Canadian Wilderness together. The group did well catching Northern Pike & Smallmouth Bass during their 3 days and were very impressed with the wilderness atmosphere. All had a great time and made some wonderful family memories. 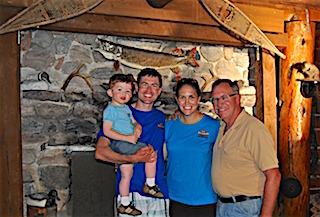 Father / Grandfather John Murphy from Bloomfield, MI and Brian with his sons Quinn & Jack from Darien, CT returned to Fireside Lodge for their 4th time for their traditional family fishing trip started years ago with John & Brian. 1st day they did great catching 30 Northern Pike. Their 2nd and final 3rd days were just as good or better catching many Northern Pike and a few Smallmouth Bass. Every evening Brian & his dad would fish until sundown enjoying good conversation along with a good cigar. All left with another set of memories between 3 generations.